The change in name happened in 1968 when the word ‘Doctrines’ was dropped. “This has resulted in our BOD focusing more and more on the mechanics of running the church. If there is any reference to doctrine, it is given honorary position at the beginning of the book, but is often neglected as a relic from the past. Most, if not all, of our time in conference is spent on organisational mechanics with little or no attention on doctrinal matters especially in terms of new challenges or questions. “Take, for instance, our oﬃcial teaching on the sacraments. Apart from minimal statements in our BOD, we do not have any oﬃcial documents that we can refer to when addressing the many questions that are often raised by church members, lay leaders and even pastors. The Bishop urged the GC to consider formalising a body that will look into doctrinal matters so that statements and stands can be made from time to time, especially when pastoral direction is greatly needed and the church needs to speak clearly and with conviction. The Bishop also raised an issue concerning worship and liturgy which he had brought up previously. “Our liturgy has theological and doctrinal significance. We used to have in our BOD a section on liturgy and worship patterns, but we have taken that out for practical reasons. However, we have not published a separate oﬃcial Book of Worship, as they have in the Methodist Churches in Britain and the US. We also do not have an oﬃcial hymnal. 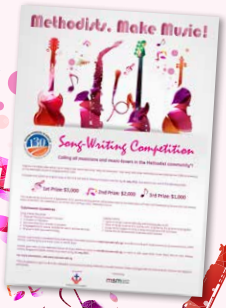 “By convention, often we use the United Methodist Hymnal and the Book of Worship of the United Methodist Church. But we have not as a GC decided oﬃcially that these were to be our oﬃcial liturgical books. 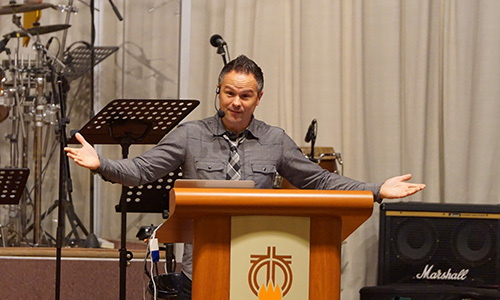 The conference attendees were reminded that a Methodist has to be in serious pursuit of holiness and to be in strong covenant with other Methodists. “ There is mutual accountability to be practised even as we faithfully use the means of grace in our growth as disciples of Christ. Yet, as the years go by, and as the spiritual fire diminishes, there is the danger of growing nominalism and spiritual apathy and unfaithfulness.” How can we bring back some measure of mutual accountability so that we can spur one another to God’s holy love and good works (Heb. 10:24), asked the Bishop. For clergy, there are processes to ensure that pastors maintain their doctrine and life. In early Wesleyan tradition, accountability for church members was exercised in the class meetings and those who were not keeping the covenant or taking their membership seriously were taken to task and challenged to be faithful. is valuable process has largely been eroded over time. Said the Bishop: “Not only are there members who grossly neglect the spiritual disciplines and therefore fail to show signs of God’s grace in their lives, but there are others who deliberately cause problems in church. “Recently I was in a church when the church leaders referred to a church member as a ‘troublemaker’. If he was indeed a troublemaker, the BOD does mention those who cause dissension in church and those who speak disparagingly of others (para 115) and how to deal with such people. “There is also the emphasis given to the fact that ‘All members are to be held accountable for their faithfulness to their covenant and vows with God and the other members of the church’ (para 114), and should they fail in this, appropriate pastoral and administrative measures need to be taken. These are all spelt out in the BOD, including processes whereby members may be charged for serious oﬀences. The Bishop touched on one other area in which the Methodist spirit is crucial: our connectionalism and covenantal unity and responsibilities. He gave two examples that may show that our connectional relationships are not as strong as they ought to be. First, several of our GC agencies have indicated their diﬃculties in getting widespread support within our connection for their programmes. Granted that there is a need to improve communication and interaction, the problem often remains in spite of valiant eﬀorts. The diﬃculty seems to lie not on lack of information, but on lack of connectional identity and aﬃnity. “Why is it that churches seem to show greater support for non-Methodist events rather than those organised for our own denomination? Thankfully this is not always the case, but it does happen often enough to raise concerns among our agencies. “Could it be that we are slowly drifting away from being a denomination to being a loosening group of churches that are becoming more and more congregational in practice? We may need to remember part of our identity as a mission, where pastors are missionaries of the denomination and local churches are mission outposts. These challenges are not only faced at the level of the General Conference but, as the Presidents have shared with me, also at the Annual Conference level. “Second, recently one of our smaller churches was able to secure permission to regularly use the premises of a non-Methodist church. 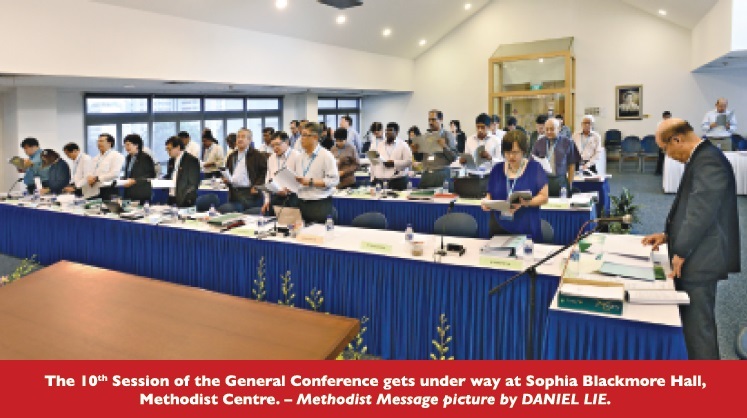 The leaders of the non-Methodist church were very welcoming, readily oﬀering their second biggest hall for what was to be a small pioneering group. OUR CONNECTIONAL NATURE and structure is a special strength when we consider opportunities for new ministries that we can do best collectively as a denomination. Stating this in his Episcopal Address, Bishop Dr Solomon sketches three possibilities for the future: A Methodist Family Life Agency, a Methodist Community Hospital and a Methodist University. • A Methodist Family Life Agency. In recent years the Bishop had discussed with the Annual Conference (AC) Presidents on the need to pay closer attention to family life in our churches. The Bishop and the Presidents have met resource persons and practitioners in family health and discussed the possibility of setting up a Methodist Family Life Agency that can champion and promote biblical family values and healthy family living through educational and preventive programmes and material. This would help the whole Methodist community. The Bishop has shared this idea with Methodist Welfare Services (MWS). If necessary, he said, the General Conference may want to consider establishing a new agency along these lines. • A Methodist Community Hospital. 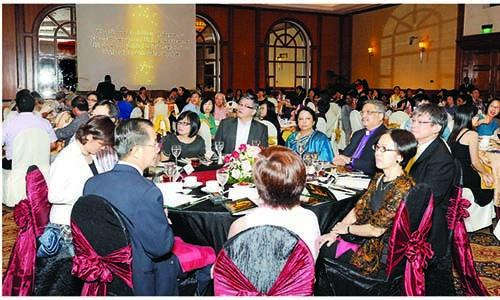 Singapore is in the process of building new general hospitals and connecting them with respective community hospitals for step-down care. It is believed that the Government is open to working with partners to help run new community hospitals and is prepared to finance most (if not all) the expenses of running a community hospital. The Bishop said that our heritage of community service includes medical and nursing ministries, and it makes sense to consider expanding our current range of services to include a Methodist community hospital. He and the AC Presidents have met some leaders in the field to explore the possibility and requested MWS to consider this suggestion. • A Methodist University. 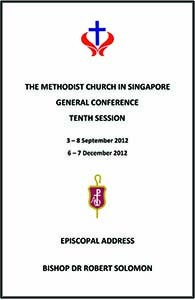 e Methodist Church in Singapore (MCS) has a long and distinguished history of educational mission, oﬀering quality education ranging from kindergarten to pre-university education. ere have been suggestions that a Methodist university be established to widen the scope of our educational mission. The Bishop said there was a much earlier attempt to establish a university, though the idea did not materialise. Is it time to revive the idea, he asked. He and the AC Presidents have met Methodist educationists to explore the possibilities.